One Madison Park, which has been recently renamed One Madison by its new owner/ developer, was largely completed in 2009, but the project hit the market at the beginning of the recession, and the first developers had to declare bankruptcy and sell the building. MEP Engineers: MGJ Engineering, P.C. G.F.A. : 163,500 sq. f.t | 49,834 sq. m.
One Madison. Image: David Sundberg, ESTO. Text and images for this page were provided by Cetra Ruddy. Facing Madison Square Park, at the intersection of two major thoroughfares, 23rd Street and Madison Avenue, One Madison is uniquely situated on the Manhattan grid with a prominent axial position. At 620 feet high with a 5,175 square-foot footprint and 50-foot wide base, One Madison is extremely slender, with a ratio of 12:1. The constrained site limited the building's floor plate, necessitating a clever design that would maximize space and views. Diagrams showing site location and transfer of air rights. 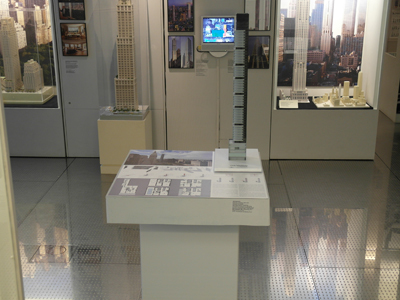 Part of the challenge in developing the design, materials, and aspects of the structure, was to create a modern building that was in concert with the fabric of Madison Square Park and the classic architecture of the neighborhood. The main tower shaft is composed of earth-toned bronze glass, enabling the tower to blend with the older surrounding limestone and masonry buildings. 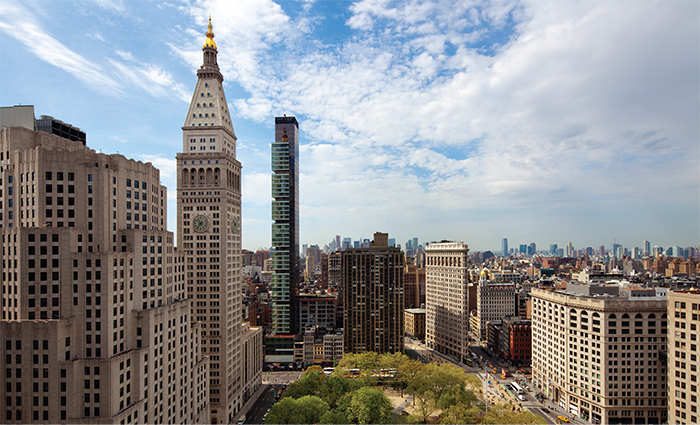 Similar in proportion, One Madison and the MetLife tower rise above the neighborhood, creating a dialogue between traditional classism and contemporary architecture. The tower's modular form is delineated by seven volumetric pods, constructed from clear white and green glass. These cube-like forms deconstruct the building's mass an give it a sense of lightness. Unlike typical residential and commercial buildings, this modular concept creates varied units and a combination of effects allowing for a unique and expressive building form. Floor-to-ceiling glass walls draw the eye outwards to the city, creating a dramatic and picturesque backdrop that changes with the seasons. Cantilevered from the main shaft, the pods lend functionality beyond their aesthetic appeal, extending the tower's 2,700 square-foot floor plate to 3,300 square-feet and modulating the building form. This unique feature grew out of the need to expedite construction on the main tower and from the desire to offer a mix of apartment types, some with terraces. Comparison of structure and views. Residences range from 805 square-foot studios to a 7,143 square-foot triplex penthouse, and the property features luxurious amenities, including a spa, swimming pool, fitness center, media/screening room, children's room, and outdoor terrace park. To create a serene and intimate entry, residents enter the building on 22nd Street, a configuration that also allows for a ground floor commercial space to complement the existing retail activity of 23rd Street.